The Course & Tee option allows you to manage all courses and tees associated with scores. Having this information in the system speeds up the process of entering scores, especially if you are playing often on a few number of courses. Go to Dashboard > Settings > Course & Tee. To add a New Course, you will have to click on the green button. After you have typed you Course Name and saved it, you will be automatically transitioned to add your first tee. 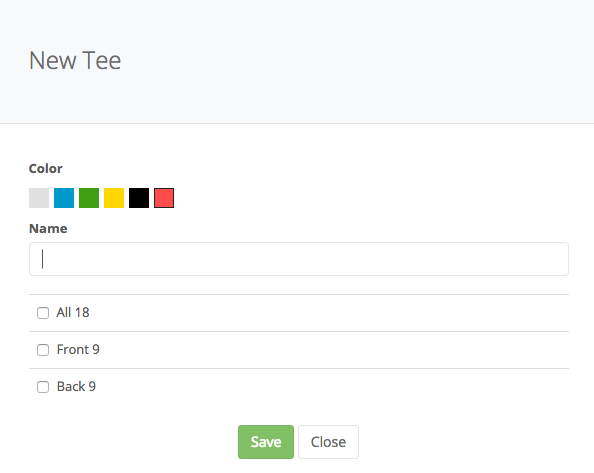 Once this is saved, you can add more tees by clicking on New Tee. If you did everything correctly, it will show up like in the following picture. When entering a new score, you will be able to select one of the existing courses and tees without filling in the rating and slope again.